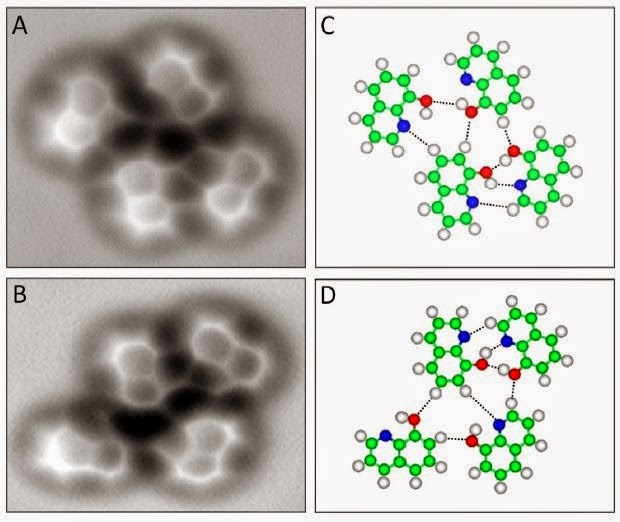 Researchers at China's National Center for Nanoscience and Technology and Renmin University have used Atomic Force Microscopy (AFM) to create an image of the weak hydrogen bonds present in a molecule. In their paper published in the journal Science, the team describes how they used the non-contact form of AFM to capture an image of weak hydrogen bonds in a 8-hydroxyquinoline molecule (8hq). Until recently, the most accurate images of molecules were obtained using scanning tunneling microscopy, recent advances with AFM, however (particularly the addition of a carbon monoxide molecule to the probe tip) have made it the method of choice for obtaining actual images of molecules and the bonds that hold them together. In this new effort, the research team has advanced the science of AFM by capturing an image of the weak hydrogen bonds present in a 8hq molecule. Understanding how hydrogen bonds work is a very important part of science—they are responsible, for example, for holding together strands of DNA. Currently, there are two ways to capture images using AFM: contact, and non-contact imaging. With contact imaging, the tip of the mechanical probe is made to touch the surface of the material being analyzed. The amount of deflection of the probe tip as its dragged is used to create an image. In non-contact mode, the tip is brought near to the surface, but doesn't touch it. An image is created by measuring changes to the oscillating tip probe from weak forces emanating from the source. The team in China used the non-contact form of AFM and chose 8hq as a test subject because it's a relatively flat molecule. The resulting image is the first created using AFM to show weak hydrogen bonds, and is important because there is still debate about the nature of hydrogen bonds. For many years it was considered to be purely an electrostatic interaction—new evidence has cast doubt on that idea, suggesting that it might be at least partially chemical. The new image doesn't clear up the debate, but does offer some intriguing possibilities for the future as it demonstrates that as AFM matures, it will offer more and more evidence of the true nature of molecules and how they interact.